The giant planet Saturn, as observed with the VLT NAOS-CONICA Adaptive Optics instrument on December 8, 2001; the distance was 1,209 million km. 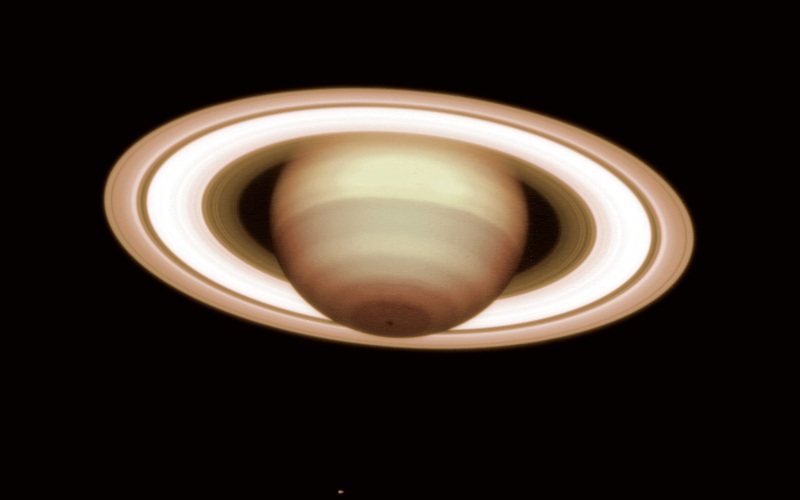 It is a composite of exposures in two near-infrared wavebands (H and K) and displays well the intricate, banded structure of the planetary atmosphere and the rings. Note also the dark spot at the south pole at the bottom of the image. One of the moons, Tethys, is visible as a small point of light below the planet. It was used to guide the telescope and to perform the adaptive optics "refocusing" for this observation. More details in the text. This image of Saturn, the second-largest planet in the solar system, was obtained at a time when Saturn was close to summer solstice in the southern hemisphere. At this moment, the tilt of the rings was about as large as it can be, allowing the best possible view of the planet's South Pole. That area was on Saturn's night side in 1982 and could therefore not be photographed during the Voyager encounter. The dark spot close to the South Pole is a remarkable structure that measures approximately 300 km across. The bright spot close to the equator is the remnant of a giant storm in Saturn's extended atmosphere that has lasted more than 5 years. 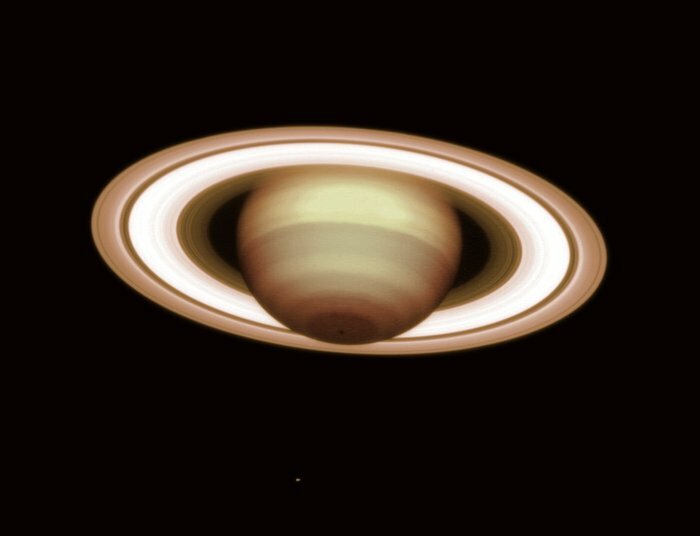 The present photo provides what is possibly the sharpest view of the ring system ever achieved from a ground-based observatory. Many structures are visible, the most obvious being the main ring sections, the inner C-region (here comparatively dark), the middle B-region (here relatively bright) and the outer A-region, and also the obvious dark "divisions", including the well-known, broad Cassini division between the A- and B-regions, as well as the Encke division close to the external edge of the A-region and the Colombo division in the C-region. Moreover, many narrow rings can be seen at this high image resolution, in particular within the C-region.